We all know how nice it is to sit on our front porch or backyard when the weather’s nice. We were meant to breathe fresh air and hear the sounds of everyday life rather than the sounds of the TV set or pot and pans banging in the background (like in small restaurants). It’s easy on the mind and healthy for the soul. Since cafes and coffeehouses are designed for lingering, the quintessential third place, providing outdoor seating is a must. In our focus groups, half of the places that people listed as their favorites had outdoor seating, and those were mainly cafes and coffeehouses. We could all use a little respite from stress on a daily basis, and having a drink or meal outside is one good way to do it. 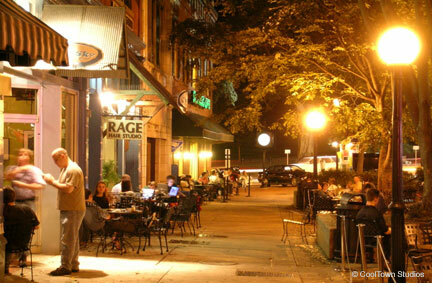 The photo here is of downtown Athens, with people enjoying the night sky outside both a cafe and a coffeehouse.